Prince Leleiohoku’s glittering gold bar, 1922. 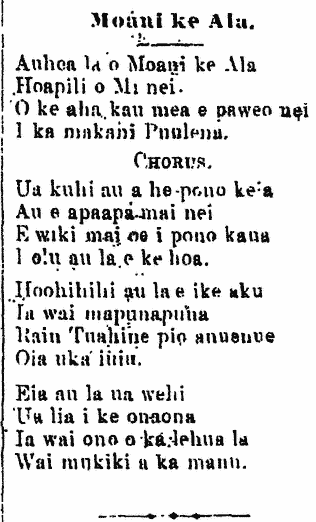 Lilelile lua nei la a u.
Nana nuu ke poo laa u.
Luhi a loha i ka wai la a u.
Oni e a olalo la a u.
Ka Nupepa Kuokoa, Buke LXI, Helu 7, Mahele Elua, Aoao 2. Feberuari 17, 1922. 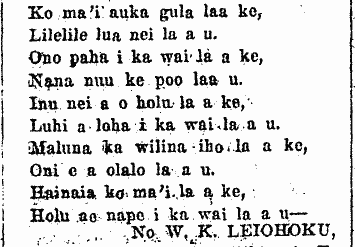 The 1874 speech of Leleiohoku at Kalaupapa, 1891. THE SPEECH OF THE REGENT, PRINCE LELEIOHOKU, AT THE COLONY OF KALAUPAPA, MOLOKAI. O Citizens of the Alii, King Kalakaua I., a fraction of his people, aloha to you. This was the day that we gained the independence of this our mother country, and it is a day for you, Hawaiian people, to rejoice. In this rejoicing however, there is also something to be anguished and mournful about, for if you turn and look back, there is not your wife, or children, or your family, or the rest, if you are a man who was separated here by the government to come to Kalaupapa; auwe, this is something that pains his heart for his companion, his wife; and so too for the woman who grieves for her husband; and the parent who grieves for his child, and the child for his parent, and so forth. O Makaainana of King Kalakaua I., living in this friendless land, you have but one friend, that being the protection of the government. This painful burden that you have been stricken with does not come through the control of the child of man, but comes from God. Therefore, all you makaainana who have aloha for your alii, I am one of your parents, but I am powerless to divert the power of the law, for I am but a student of the law; yet it pains me to see you, O Beloved makaainana; I first saw some of you turning your faces away from mine. But should there be a time in the future, when the rule falls totally upon me, then that will be the time when I will search out and put my efforts into finding relief for all of us, but that lies in the hands of the one who created us. Therefore, O Beloved makaainana, do forgive me, and may the power of the Lord help us all. Ka Leo o ka Lahui, Buke II, Helu 289, Aoao 2. Sepatemaba 25, 1891. I olu au la e ke hoa. Wai mukiki a ka manu. Ka Lei Momi, Buke I, Helu 11, Aoao 3. Iulai 5, 1893.